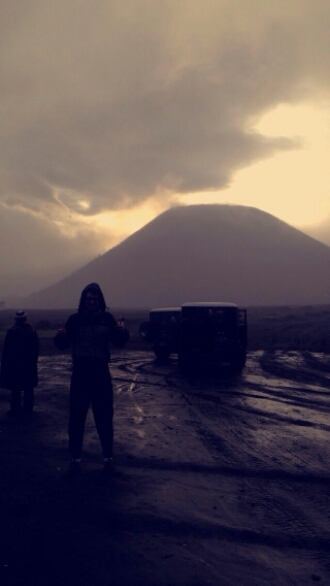 Don’t go to Mount Bromo in bad weather – Where's Walton? 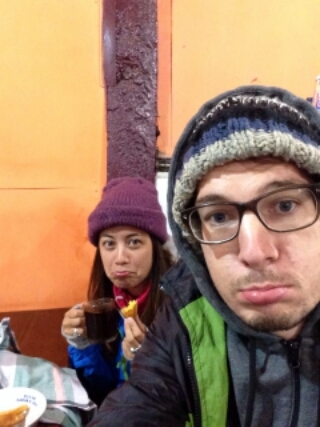 In the lead up to climbing Bromo the day had not started well for Steven and I. We had been up since 7am that morning, caught a 2-hour delayed flight to Surabaya (where the recent missing Air Asia flight flew from) so we were feeling anxious. Also we argued a lot that day as we have very different ways of travelling. On arrival to places Steven likes to jump in taxi’s in order to have a stress-free journey to accommodation in a new unfamilar place, which is fair. But my own personal preference on my travels is to attempt to walk or find the local bus to where I’m going and ask for directions when I arrive, also I just really really don’t trust the taxi drivers that immediately pressure you. 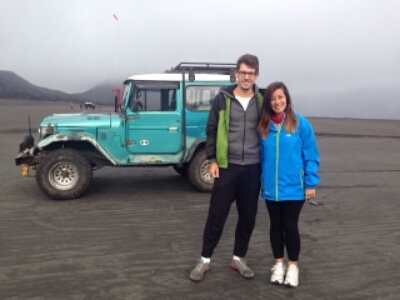 On this occasion Stevens suggestion of a stress-free journey might have been the better option when I tell you about our Bromo experience. 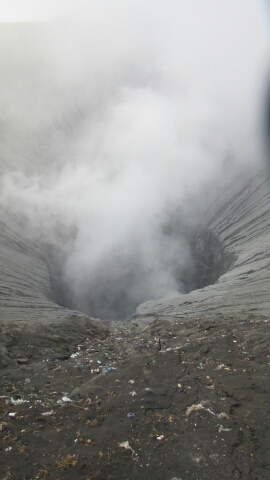 Bromo, at 2,329 metres (7,641 ft) is an active volcano and part of the ‘Tengger massif’, in East Java, Indonesia. Ir is not the highest peak of the massif, but is the most well known. 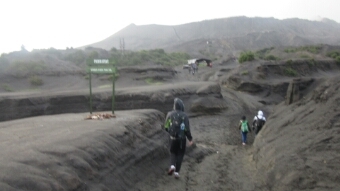 The massif area is one of the most visited tourist attractions in East Java, Indonesia. 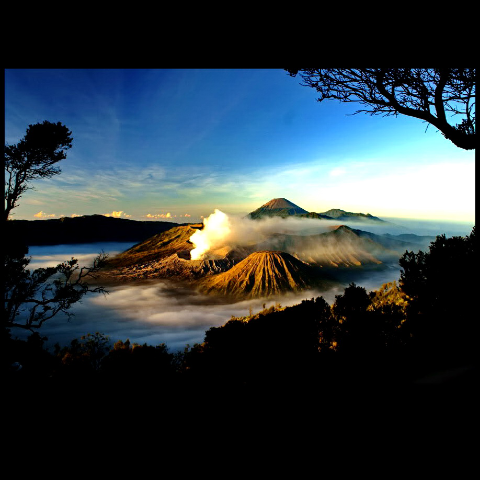 The name of Bromo derived from Javanese pronunciation of Brahma, the Hindu creator. From other travellers I had heard this climb was easy so I was really up for doing this as cheaply as possible. To be honest I had done little research about Java – my main interests in Indonesia was Bali and the Gili Islands so I had no idea what to expect and left most of the planning to Steven. How hard could it be! We were staying in a town called Melang because it was the closest town to Mount Bromo on the map and after walking around for food it was obvious this was very much not a touristy city. The negative of this being you stand out like a sore thumb, but the positive is everything is so much cheaper. 15,000rp (75p) for dinner and a drink – fantastic!! It turns out most tourists go to Surabaya instead for Bromo but we took a chance on Melang based on reviews of Surabaya – apparently it’s not an ‘easy to love’ city. So on arrival to our accomodation I had a face of thunder when the receptionist at our guest house told us it would cost 500,000rp (£25) per person to climb it. That’s not a lot of money in the UK but here it’s more than 25 meals! From talking to local people in Java I learned that they (taxi drivers, shop workers) make about 1,000,000RP a month, £60 so local people could not afford this with all their other outgoings. 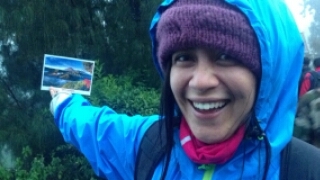 The tour would include travel and entrance fee to the mountain and would start at midnight and end when we got back to the guesthouse at midday the next day. It’s a mountain, you get there you walk up, you take some snaps then you walk back down? Right? What am I paying for? I was a bit stressed at this point as I was way over my budget and I presumed climbing a mountain would be free and we’d just pay a driver to get us there. After considering it over dinner and looking back at the flight, 2 buses and taxi ride to get here we had to do it. So we went back to our hostel to book it. Then to find out the price had increased to 750,000rp (£40) because we were the only ones on the tour. My face my not a pretty picture at this point, I hate feeling like I’m being ripped off. And I was certainly not happy with Steven as this was his part of the trip which felt really unorganised and unplanned. Anyways after a long discussion with our guesthouse owner and I a lot of prolonged awkward silences we managed to get the price down to 650,000rp. It was 10pm at this point – we had 2 hours to prepare and nap. So 2 hours later the driver picked us up at midnight to drive us to the bottom of the mountain where we would then be taken by driver number 2 in a jeep. We had a lot of questions but unfortunately we didn’t speak Indonesian and he didn’t speak English. An hour and a half later we arrived in a little town a bit of the way up the mountain that looked like little homestays. It was dark, we’d slept an hour and there was no one around but us… and as we got out of the car it hit us. OH MY IT WAS FREEZING!!! We heard it was “cold”, but this was English weather we’d not experienced in a long time. I figured as we’d be trekking we’d start warming up but it soon became apparent that was not going to happen for a while. At this point Steven and I piled on every item of clothing we had on us. The jeep journey to the view point was an experience in itself. For another hour and a half you are getting driven in a 4×4 in darkness… around cliff points, unmarked roads and dirt tracks – the rockiest roads I’ve ever seen. As we drove for a while we were puzzled to why we hadn’t seen anyone else yet? But at this point we saw lights ahead… it was a car stuck in the mud waving at us for help. However instead of helping our driver just drove on. How nice! At this point I thought, fair enough to booking a driver, I can see why we needed one for this because at least this guy knows the roads and where not to drive. We arrived near the view point at 2.45am. Why? I have no idea because sunrise wasn’t til 5.30am… now what? We could have had 2/3 hours longer in bed! We took shelter in a little shack café for warmth, it was getting colder and colder and we had nothing to do but sit around and drink tea and coffee. Soon after this more Indonesian tourists began to arrive and everyone was buying clothing from the little store. To my surprise, considering how much is costs to climb the mountain – handmade knitted hats are a mere 20,000rp (£1) and jumpers 100,000rp (£5). Also drinks were just 5,000 (25p). Don’t get me wrong, I was happy it was all cheap, but why do the land owners need to profit so much when the locals don’t? 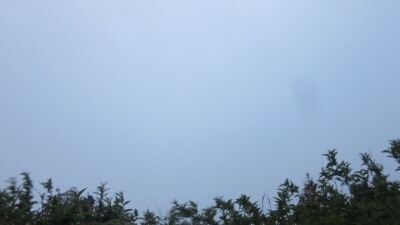 So 5.30am came along…and all we expected this. At this point, with our bad day, lack of sleep, overpaying, waiting 3 hours and freezing our butts off…to see cloud. Steven and I started to lose it a bit, mentally. We started to find the whole thing hilarious!! What else could we do! We decided at this point that to leave the view point and go back to the driver to take us to where we needed to go to climb Bromo to see the crater. Let’s get some exercise!! Hopefully by the point we’ve climbed it the weather will have improved. Big Anti-climax. 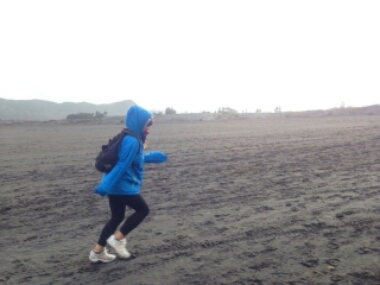 Bromo literally took us 20 minutes to walk up… I have no idea why reviews online say it takes 1-2 hours. At first we thought he took us to the wrong place, I still kind of hope he did. At the bottom people have the option of a horse taking us up half way… then there’s 100 steps and you’re there! The weather was still cloudy at this point so the view down wasn’t the best… as we drove back down the mountain over the dusty roads we stopped to take a few snaps. We could start to see hills of green popping through but not enough to really make us the value in being there. All I could think was… why didn’t the guesthouse advise against coming to this? The night before I’d shown him the weather report on my phone and he still said nothing. Why is it always about making money? When we got back Steven and I made a decision… let’s pack our bags and get on the next train/bus/car out of Melang!!! After looking at every option possible and Steven even hitching a scooter ride to the train station to buy us a ticket (all sold out), our only option was a night bus at 8pm to Yogjakarta. It would mean a bad night sleep after no sleep the night before but we didn’t want to waste another minute here – there was nothing else to do in town. 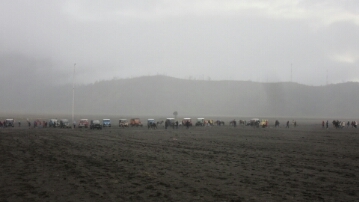 We felt really let down by this place and felt like there should be more information around on Mount Bromo at off peak season, from everything we read the night before it all seemed worthwhile whatever the time of year. 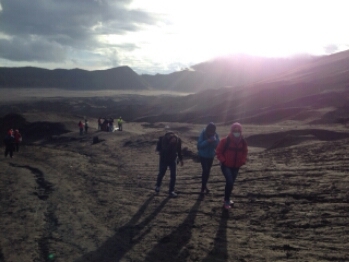 Even if the weather was good I wouldn’t consider what we did ‘climbing’ mount Bromo because this place doesn’t seem so much a challenge but a nice photo opportunity. So, like us, if you go at off peak season and don’t get to witness the view it is a big let down. Also the park fee is 229,000rp however the roads being as rocky and as unsafe as they were it makes you wonder where the money. Personally I think they keep the roads as bad as they are so you need to book a 4×4 tour because if you tried to do it yourself it’s very dangerous. Or maybe it’s about maintaining nature… hmm. I doubt it somehow if they are allowing cars to drive and scooters all over the park. I’m sorry but I’m still bitter. 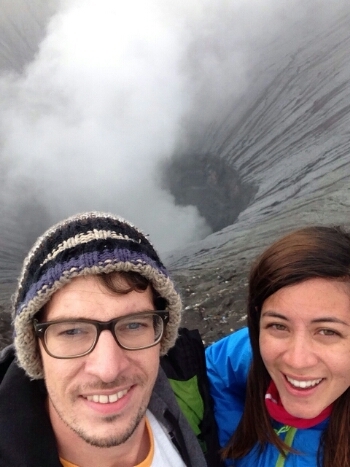 Hi, we are planning a visit to bromo at the end of Feb -would you say the views would be bad at this time? We are travelling with a baby, so wouldn’t want to make the trek with him if there is a high chance of us seeing nothing! Appreciate your reply. Thank you. 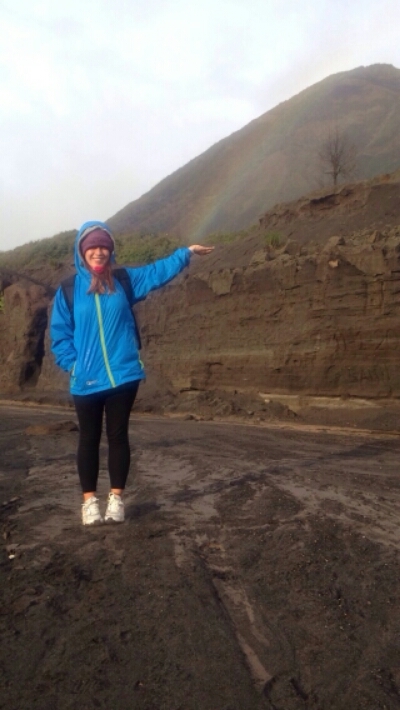 which month you visit Mt Bromo? ← Why haven’t we left Ubud yet? ?